La Capannina di Matteo is located a few hundred metres from the ancient Roman road called Via Cassia, right outside the centre of Tavarnelle Val di Pesa, halfway between Florence and Siena, in the heart of Chianti and surrounded by the famous hills that made Tuscany known all over the world. 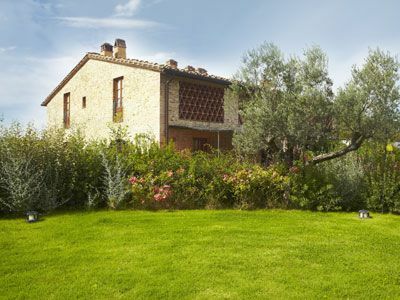 Agriturismo La Capannina di Matteo orginates from the restoration of a typical tuscan villa that was a farmhouse. The farmhouse is close to a romanesque church dating back to the 5th Century, and is made of 6 charming holiday apartments with private pool belonging to the Fusi family, that ensure relaxing holidays in Chianti to all its guests. When choosing this accomodation, guests will enjoy a unique holiday in farmhouse in Tuscany, a few kilometers from the town centre, yet surrounded by nature. There are many outdoor activities for children and adults that can take place at Holiday Homes La Capannina di Matteo: you can choose to relax by the private pool, or to make excursions in Chianti along the trekking routes around the farmhouse; you can make bike tours or flying with hot air ballons; from here you can leave for daily visits to Florence, Siena, San Gimignano, Pisa and all historical cities of Tuscany. Wine and Olive Oil tasting are also available, together with all other typical products from the Chianti area, to make your holiday in Italy unforgettable, whether you visit for a weekly rental or for a weekend in the countryside. In the heart of Chianti, La Capannina di Matteo is located in a strategic position to visit all historical sites in Tuscany. It's the ideal stopping place for trips of fascinating discoveries in a region rich in cultural testimony. Florence, Siena and San Gimignano can be easily reached by car or bt public transport. Closest towns are the medieval Barberino Val d'Elsa, Greve in Chianti, the "capital city" of Chianti Wine, and Certaldo, the birthplace of Giovanni Boccaccio. Nearby there are a tennis court, a horse riding centre, some restaurants with typical tuscan foos, some banks, a post office, a 24 hours Self Service Gas Stagion, a shopping area and it's possible to do excursions in hot-air ballon or do nordic walking. In Tavarnelle there are all kind of shops and services.